Authors: Lo, S.-Z. A.; Rossi, A. M.; Murphy, T. E.
Abstract: We report an experimental measurement of far infrared dielectric properties of p+-doped free-standing porous silicon membranes, characterized using terahertz time-domain spectroscopy. Freshly fabricated hydrogen-terminated porous silicon samples exhibited significant absorption in the terahertz regime, and the absorption was observed to slowly drift in response to the surrounding environment and the duration of illumination. Samples that are partially oxidized, either by age or through thermal oxidation in an oven, become almost transparent in the terahertz spectral regime, and the dielectric properties stabilize to a constant value. The partially-oxidized porous silicon samples are observed to have an absorption coefficient of approximately 2 cm–1 over the range of 0–2 THz, which corresponds to an effective resistivity of 35 ± 9 Ω cm, approximately four orders of magnitude higher than that of the crystalline silicon from which they were formed. 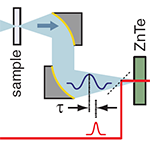 Spectral transmission measurements further confirm that p+ porous silicon has no significant absorption peaks or other spectral variation in the 0–2 THz regime. These findings suggest that p+ porous silicon could be a useful material for fabricating future THz devices.